There were plenty of signs during the 2014 World Cup that the popularity of soccer in the United States is reaching unprecedented heights. Landenberg Today decided to catch up with Michael Finnegan, who serves as the president of the Southern Chester County Soccer Association (SCCSA), to discuss the popularity of the sport locally. The SCCSA, which has produced numerous tournament and state championship teams, now has 1,300 participants, 24 travel teams, and 72 recreation teams. We also talked to Finnegan about some the challenges of running such a large organization, and his experiences during his 16 years with SCCSA. Q: What is your current position with the Southern Chester County Soccer Association (SCCSA)? A: I am the President of SCCSA. Q: How long have you been involved with the Southern Chester County Soccer Association? A: The Southern Chester County Soccer Association is a non-profit that has been promoting youth soccer in Southern Chester County since 1977. I Joined SCCSA as a recreational head coach in 1998 and moved to the administrative side in 2000 as an age group commissioner. I became vice president of the recreational program in 2002 and then president of the association in 2004. I still serve as president. Q: What programs does the league offer each year? A: We have an extensive program offering for kids of all ages and skill levels. We offer fall and spring recreational programs for kids 4 to 18 years old, and competitive travel teams for kids 8 to 18 years old. We have one of the fastest-growing and highly qualified professional training staffs in the area. We offer individual and team development sessions that cater to all age groups from Little Dragons to the high school player, including goalkeeper and striker concentrations. We have our TOPSoccer Outreach Program that enables boys and girls 4 years of age and over with physical and/or cognitive disabilities to play soccer. And in the off-season, we offer our Little Dragons and Elite Youth summer camps. Q: How many youngsters participate in the Southern Chester County Soccer Association? A: SCCSA has grown to 1300 participants, 24 travel teams, 72 recreation teams, and has produced numerous tournament and State championship teams, as well as one National Champion team. We also have a pool of 100 youth referees that we have trained for our in-house league. 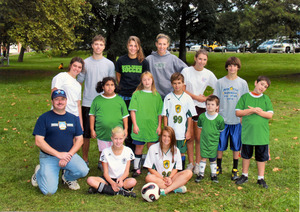 Finnegan pictured with one of the Southern Chester County Soccer Association's TOPSoccer Special Needs teams. Q: Have you seen increased interest in soccer since the World Cup? A: There was more interest in this World Cup than ever before in America. The Brazil-Germany match averaged more than 15 million viewers, on a Tuesday afternoon in the summer, while Monday Night Football games last season averaged 13.7 million viewers. Once every three years our sport gains millions of additional fans. Even if we only keep a few hundred thousand once the games are over, or the U.S. is eliminated, we are still gaining fans. Q: How popular is soccer in southern Chester County? A: Soccer probably has the largest participation of all sports in Southern Chester County. At the high schools and middle schools, it is closer to all of the other sports, but in the youth clubs, soccer has much more participation. Our 1300 players for just soccer exceeds the total number of participants for other local sports organizations that offer five or more sports. Eastern Pennsylvania has 125,000 registered youth soccer players, and the U.S. has over 3 million players. In comparison, in the U.S., Little League has 2 million players and there are 700,000 lacrosse players. Q: Tell us about your background with soccer. A: I grew up with soccer. My grandfather played back in Ireland. In my youth in Philadelphia, I played club at Lighthouse and Parkwood, and four years of varsity at Roman Catholic High School. An ankle injury kept me from playing at Drexel, but I played some indoor and adult league later on. Lately, I have been in on the administrative side, serving 16 years with SCCSA, and at the State and Regional level. My involvement includes serving as EPYSA District 14 Commissioner from 2006 to 2013 and State Vice President for the past year. In 2010, I was named EPYSA and US Youth Soccer Region 1 Administrator of the Year and was a finalist for the National award. Q: What are the biggest challenges that you face in your role with the Soccer League? A: SCCSA is a club that prides itself on providing a program that is available to kids of all abilities, and is affordable to kids from any socioeconomic background. In particular, the neighborhood that encompasses SCCSA includes a large Latino population. Keeping our costs down while providing quality programs is a challenge, as we are funded only by our registration fees and some sponsorships. We receive no funds from the municipalities that we service. We recently engaged in a long-term lease with the Kennett Area Park Authority and have developed a 10-acre fully irrigated soccer park adjacent to Anson B. Nixon Park. We run our travel and camp programs there as well as have fields available to the public free of charge. The maintenance expenses for the fields alone are astronomical. Finnegan attended the U.S. Soccer Federation meeting in New York City this past winter. During his tenure with the Southern Chester County Soccer Association, Finnegan has served as EPYSA District 14 Commissioner from 2006 to 2013 and State Vice President for the past year. In 2010, he was named EPYSA and U.S. Youth Soccer Region 1 Administrator of the Year and was a finalist for the National award. Q: What is your favorite spot in Landenberg? A: Paradocx Vineyard and Schmidt's Tree Farm, especially in the fall. Where else can you taste wine, find your way through a corn maze, and then shoot pumpkins from an air cannon? Q: What three dinner guests, living or dead, would you invite to dine with you? A: Wow, never had to answer this one before, but here goes…Abraham Lincoln because he was president during the most difficult of times and kept our country together. It would be interesting to hear if it turned out the way he thought it would. Queen Elizabeth because of all her years on the throne, she has known every significant world leader from the 1930s through today and has ruled during the election of 10 of our presidents. Imagine the stories she could tell. And Bruce Lee. His writings during his brief life touched on the philosophical subjects of work ethic and life. I’m sure he had much more to say that we could benefit from. A: Milk and not much else since my son was home from the University of Delaware for the summer.